Splitting 1 : 350 Academy-Minicraft 30"
It has been -literally- years since the genesis of the idea, but we've finally completed a series of [Model Titanic Splits] videos, along with a how-to video describing the building of the model! Check out our newest video, made as a 100th-anniversary tribute to the sinking, on your left. Seen it already? 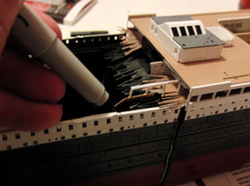 We've got behind-the-scenes video, additional splitting footage, a how-to tutorial, and three pages of build photos for you - a detailed look at the construction of the splitting Titanic model. Just click the videos and links below!